Unsure of best seeds varieties for your business ? Want to know what are the newest and best qualitative and high yielding product? then you have come to the right place. INDO US BIO-TECH LIMITED An ISO 9001-2008 company is involved in crop research & development throw breeding, production of seeds, processing, packing and marketing of high performing hybrid and open pollinated varieties of agricultural crops. (seed testing, soil & water testing). INDO US BIO-TECH LIMITED consider (I) its R&D, which confers competitive advantages to the farmers, and (ii) its scientific activities, as the key success factors in developing and commercializing several superior hybrids. The R&D centre of INDO US BIO-TECH LIMITED has been accorded recognition by the department. We got certification of registration as seed importer from "NATIONAL SEEDS CORPORATION LTD." We have got approval from DSIR (Department of Scientific & Industrial Research) New Delhi for research & development programme which is held at our R&D centre. R & D is focused to meet the requirement of farmers, markets and agro-industries to provide cost –effective technologies. The company consistently focuses on the changing preferences and needs of farmers, adding value to its products, and cautiously addressing the environmental concerns. INDO US BIO-TECH LIMITED believes In increasing the productivity by using methods that are environmentally compatible and economically sound by integrating new technological developments like biotechnology and genetic engineering with conventional plant breeding methods. The company has placed major emphasis on genetic enhancement programmes in order to develop trait-specific germplasm and to integrate biotechnology programmes to speed up and support conventional breeding programmes to deliver definite performing products. INDO US BIO-TECH LIMITED have created a wealth of germplasm through its in-house research programmes which are used to developed tailor–made hybrids. The organization has also developed a massive, systematic national trials network in different agro–climatic zones of India to test the adaptability and suitability of the newly developed products. INDO US BIO-TECH LIMITED is engaged in multi-disciplinary crop improvement research programmes. The R & D team includes plant breeders, crop protection specialists, agronomists, seed technologists, biotechnologists and physiologists. INDO US BIO-TECH LIMITED human capital is highly qualified, competent, dedicated and experienced. INDO US BIO-TECH LIMITED as a policy focuses on products and development activities that are likely to have practical market uses, create significant market value, command best prices and capture leading market share locally and globally. 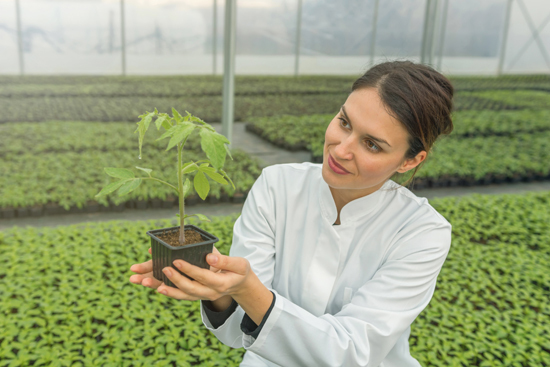 INDO US BIO-TECH LIMITED have directed its focus on developing in-house biotech products for virus resistance, nutritional quality and storage quality for different crops.